I've never been to an auction before. Sure, seen plenty on TV. I remember this show on BBC about people selling at auction houses different antique objects they found at garage sales or in their grandparents' house. Ever since I laid eyes on some of the objects in Bowie's collection I wanted to go to Sotheby's auction, but I am still in my early 20s, working my modest paid architectural assistant job.... So...yes, I can't quite afford to buy any of the pieces I liked, and obviously the ones I like the most are likely to go for high scores. And so, I abandoned the idea of attending for a while. But a few days before the event, it got my attention again and decided Zutter shall go! Getting a ticket was impossible. As a high profile event in London, everybody wanted to go! In order to get a ticket you had to email Sotheby's to register and Sotheby's server was full. All I got was a notification a day later saying the delivery will be delayed. Still, I went and I was greeted in front of the auction house by a crowd of people with tickets at ready, waiting patiently in the drizzling rain for the doors to open. At the doors, two security guards and a photographer were chatting up. It was 6pm, 1h before the auction start and yet the que was almost all the way to the corner. Surprisingly when the door did open and everyone rushed in, nobody seem to check the tickets. As I was wondering if I should just walk confidently in, people start to get kicked out with a flyer in their hand. Not curious enough about the flyer, I meet up with Victoria and go to Starbucks to warm up with a green tea latte. On our way back at 10 minutes to 7, now curious what had happened with the kicked out people, I notice the photographer crossing the street, going into a narrow alley between two buildings and out come a sea of people, all almost running towards the entry at Sotheby's! And among them some of the people that were kicked out before and they all had tickets in their hands! Last ones to enter, me and Victoria are handed a glass of Prosecco and the auction's catalogue. We rush in, anxious to see it all. The crowd, the painting that is displayed and about to get sold, the man on the stage with a hammer (the auctioneer), the people seated with paddles, graciously bidding. But it's not as I remembered it from the show I was watching when I was a kid. As the auction heats up, the Frank Auerbach's 'Head of Gerda Boehm' comes up and I am as excited as everyone else in the room as the bids go up and up and hit the £3 million mark. At Lanyon's 'Witness' I feel a bit deflated. It is my second favourite from tonight's auction yet it doesn't seem everyone agrees with me. It still sells for about £800 000, making it the 4th highest sale of the night. Everyone's favourite, Basquiat's 'Air power' captures the whole's room attention. My head spins like at a tennis match, from left to right, wondering who are the people on the phone, who is the lucky millionaire or billionaire that is going to own this amazing piece. As the bidding hits £5 million the bidding slows down and the auctioneer gets a bit impatient with his phone bidders. I cracked up laughing. Yet I do consider it sweet that he did think about asking before getting carried away. In the end the lucky winner spent £7million on the Basquiat. Some of the bidders in the room start to leave as the main attraction is over. 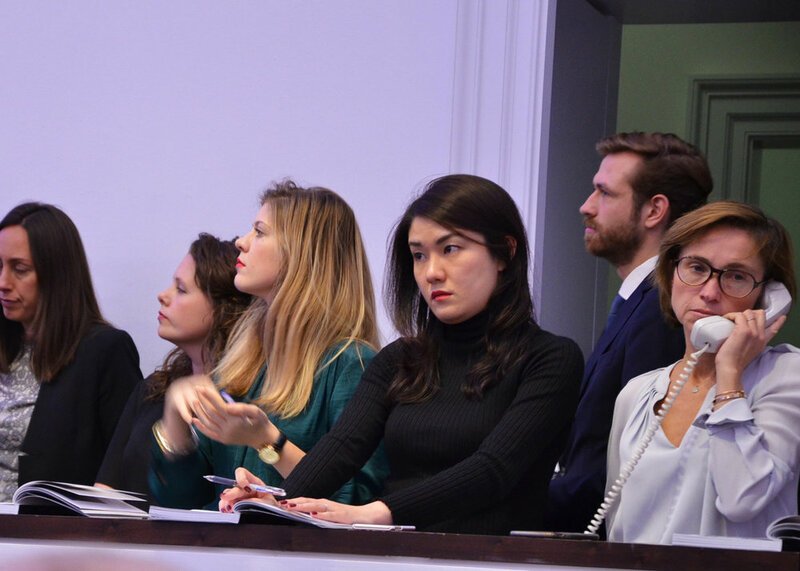 Still intrigued by the on phone bidders I take a closer look at their representatives in the room. As I get near the right end of their seating place I come across a familiar face. Not sure how many of you are familiar with her name, but let me refresh your memory. Yuki Terase is a curator for Sotherby's Hong Kong and she worked with T.O.P. for Sotheby's charity auction #TTTOP. I am sure some of you remember her from his Instagrams from the event. A bit overexcited and with trembling hands and a red face I scribble on a page from my agenda a note and Zutter's contact information over my business card. I get as close as I can and hand both the note and the card to another representative and ask him to give it to her. Nervous, I run quick back to my place, after I take a look back and see her smile while reading the note. Back on my seat, I watch the bidding go on, yet the excitement dies down and the room gets more empty. I am still waiting for the last lot of the auction, my third favourite, Damien Hirst's 'Beautiful, shattering, slashing, violent, pinky, hacking, sphincter painting'. It gets sold for £755 000 which makes it the 6th highest after Hirst's 'Beautiful, hallo, space-boy painting'.